For a true survivalist, preparing never stops. Always prepping, always researching for new survival techniques… this is part of my daily life. 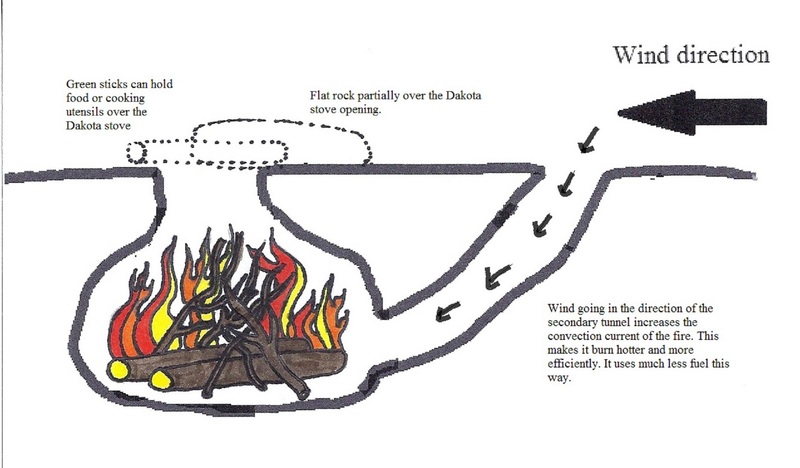 And while doing so, I realized I documented a lot on how to build a fire in the wilderness, how to start a fire without matches and other interesting things on the subject… but I only came across the Dakota fire hole just recently. I found out about it from a fellow survivalist colleague at SurvivalTopics.com and then read more on the Internet and also watched some videos on how to make a Dakota fire hole. I just have to share it with you, too. 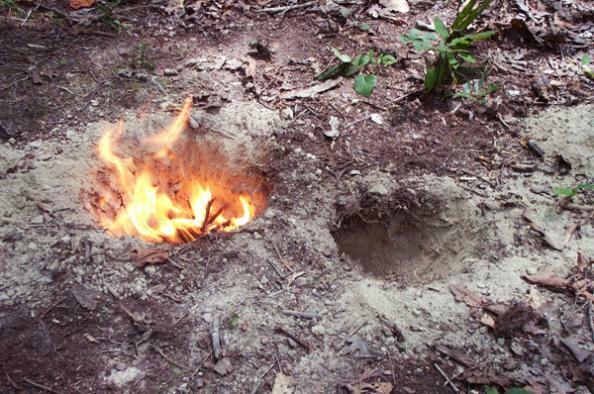 A Dakota fire hole – also known as a Dakota smokeless fire pit – is a simple fire building method, a tactic used by the Marine Corps, camping and scouting experts because of its many advantages. Some consider it an obscure fire building tradition of the Native Americans, but it’s really a very valuable wilderness survival aid that should get more attention. There are several types of fire holes you can assemble in a variety of styles and functions, according to your wishes and needs. You can even purchase pre-made fire pits from the store these days. How to make a Dakota fire hole? • Dig 2 holes in the ground –about 9 inches away from each other, about 12 inches in diameter and approximately 12 inches down. • Connect the holes to make an airway tunnel, in the shape of the letter “U”. • Light a fire (just like a regular campfire) at the original bottom of the tunnel. Congratulations, you have your own Dakota fire hole! 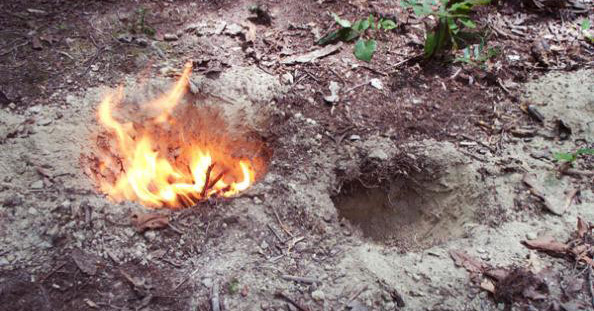 First of all, this is how a Dakota fire hole looks like in real life (thank you survival.outdoorlife.com for the image). If your final results resemble this image, then you got it right. A small hand trowel or an army folding shovel is needed for digging the holes. You should have these in your BOB but if you find yourself in a situation where you have no tools at hand, a strong stick you find in the woods will work, too. By all means, if you have to, use your bare hands to dig. You’ll also need a lighter or matches to start the fire (these are also essential items from your survival kit, so you should have no problem here). But in case you don’t have anything to light a fire with, read all about how to start a fire without matches. • You use less wood, but get more warmth and hotter fires (its structure combats heat loss); this is also great if you camp or need to stay in an area where not much firewood is available. • Very convenient for cooking – it’s designed as a platform with the fire below the surface so it easily supports cookware; also, water and food cooks faster. • Of great aid in a hostile situation – the fire throws less light and creates less smoke so it is harder to be detected by enemies, especially at night; you’ll sure want less visibility in case of an invasion. I loved this simple method of lighting a long-lasting, strong fire in the middle of nowhere and I can’t wait to try it next time I go camping with my family. In the meanwhile, if some of you have tried to make a Dakota pit, share your ideas and tricks with us. We’d love to hear your opinions and experiences.